No apologies for returning to the Irish Seed Savers Association in County Clare. An organisation like that usually sprouts from one person’s enthusiasm and drive, and it flourishes with the commitment and passion of volunteers and staff for whom the work is much more than a job. I spoke to Anita Hayes, who started ISSA, and Eoin Keane, who looks after the apple collection, in an episode last October. Today Anita and some of the people who are carrying her work forward talk some more about seed saving and the Irish Seed Savers Association. A little context may be in order too. Why does something like ISSA need to exist? Can’t gardeners just buy the seeds they want in the shops? Short answer: no. Many of the seeds on offer to gardeners in Europe are varieties that were bred for commercial production. And older varieties, selected because they offered qualities valuable to home growers, cannot legally be offered for sale. It’s a long story, and one that many people find hard to believe, but in essence the European Common Catalogue, established in the 1960s, says that any variety needs to be registered in order to be offered for sale, and the registration fee is the same for all varieties. That makes registration a trivial cost for a big-selling commercial variety and a huge drain on the profitability of a variety that appeals to even thousands of gardeners. As a result, gardeners in Europe had to establish their own living genebanks, finding, multiplying and distributing seeds using a variety of wheezes. Ever since the Common Catalogue was first published there have been various attempts to open it up, and there has been some small movement. These experiments, however, still have not properly addressed the needs of home gardeners. Until they do, the Irish Seed Savers Association and organisations like it have a valuable job to do. You can visit the Irish Seed Savers Association website and, better yet, the place itself. In addition to Anita Hayes, in the episode you heard from Tony Kay, Flora Barteau, Janet Gooberman, Áine Ni Fhlatharta and Felice Rae. 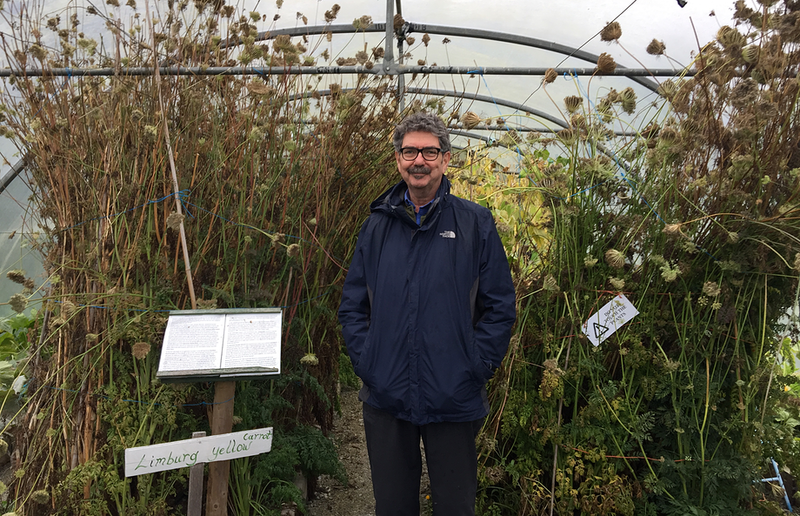 Thanks to them, to Jennifer McConnell, (who took the picture of me in the polytunnel) and to everyone else who welcomed me to ISSA. In case you missed it, here’s the episode about Ireland’s apple collection. The banner photo show’s Felice Rae’s favourite lettuce seeds, drying before she gets her hands on them. You can now search the Common Catalogue online and even see all the varieties that have been deleted since the catalogue came into existence. The music is 12 and 6, one of the tracks from AnTara, a collaboration between Tommy Hayes and Matthew Noone. Full disclosure: I was closely involved with one of the first such seed libraries in the UK and had a very small part in helping ISSA get on its feet. I’ve also written about it ad nauseam. What I would like Europe to do about agricultural biodiversity is probably the least negative place to start, if you’ve a mind to. Anna Sigrithur liked this article on twitter.com. Jenmcc liked this article on twitter.com. Jenmcc reposted this article on twitter.com. Smallholders Ireland mentioned this article on twitter.com. SAVE Foundation reposted this article on facebook.com. Matteo Petitti liked this article on twitter.com. Matteo Petitti reposted this article on twitter.com. IrishSeedSaversAssoc liked this article on twitter.com. IrishSeedSaversAssoc mentioned this article on twitter.com. A second visit to Scariff in County Clare, Ireland, to hear from the people working hard to save Ireland's vegetable heritage and make seeds available to a new generation of gardeners.